These are, without doubt, the most-discussed home-garden vegetable of all. We suspect that one big reason for the tidal wave of interest in tomatoes is the virtually total disappearance from grocery stores of edible tomatoes. We once lived in a town where a tomato-processing plant was the main industry. It was almost literally nauseating to see truck after truck full of deep-green tomatoes pull up to the plant (or should we say “factory”?) and then truck after truck pull away loaded up with bright red tomatoes made that color solely by an application of that ever-popular gas, cyanogen. Mmmmm, love them rock-hard, tasteless, unripened ’maters! But whether the interest wave is a response to a lack or whether people just love tomatoes, period, the result is the same: lots and lots—too much, almost—of information on varieties. One can even find taste-test results (many) and long threads on discussion boards with lengthy opinions on various types. But slogging through all that brings one point into sharp clarity: there are at least two very different schools of thought on tomato taste. Americans are literally spoon-fed sugar from—again literally—the crib onward. Some noted chef once remarked that each country’s cooking has its characteristic taste: in France, butter; in Italy, tomatoes; and in America, tin. He would have been more nearly accurate to say “in America, sugar.” There is sugar in virtually everything Americans are sold at the grocery store. So, it is hardly surprising that with that artificial, force-fed taste so widespread there is now lots of sugar in even home-garden vegetables…For pity’s sake, just bite into a sugar cube and spare yourself the effort of planting out…seeds. Any form of store-bought prepared tomato product—sauce, paste, and so on, or even pizzas—is today nearly useless to those already weaned from baby tastes. It’s all sugar, sugar, sugar. So if you have sympathy with our point of view, then beware most of those anecdotal reports and “taste-test” results. Only when you can read a sober and detailed discussion of the flavor qualities of a given cultivar, and find “tomato” used more often than “sweet” in the flavor description, can you assign any shred of credibility to the report. You have been warned! Our own interest in tomatoes is most sharply focussed on tomatoes for cooking—for sauces (which can be frozen), for stews, and the like—with a secondary focus on tomatoes for sandwiches and like uses and a tertiary focus on tomatoes for salads. That is mostly because fresh uses of tomatoes—sandwiches, salads, and the like—are only possible during the harvest season, whereas cooked-up sauces (and paste) can be frozen for year-round use. Tomatoes grown for cooking use have traditionally been what are commonly called “plum” or “paste” (or sometimes, from one well-known cultivar, “Roma”) tomatoes. That sort is well suited because it is very dense, with little excess water, and has few seeds and little gel, and so quickly (or relatively quickly, anyway) cooks down to a thick sauce or paste. But, as Dr.Carolyn Male—one of the world’s leading tomato experts—points out in her justly famous book 100 Heirloom Tomatoes for the American Garden, the sad truth is that most paste tomatoes don’t have much flavor; moreover, she goes on, there are many “ordinary” tomatoes that are dense and suited for cooking. And if a given variety isn’t unusually dense, just—duh—cook it down a little longer. But, though Dr Male says gardeners in USDA Zones 4, 5, and 6 “have the best selection of heirlooms that will grow well,” our own experience—granted that we are in a “frost pocket”—is that we struggle to vine-ripen tomatoes (and peppers). We, at least—and we urge this advice on all in our region till they can prove to themselves that they are better situated—need to concentrate on those suitably early good cultivars we can identify. Note that “suitably”: we don’t necessarily need the very earliest types, just those that don’t stretch our season’s envelope. Note also that qualifying “good”: there are some almost absurdly early tomato types, but earlies notoriously lack the flavor quality that is the main reason we grow our own. The number of good early types is rather small. commercial heirlooms: varieties introduced by commercial seedsmen prior to 1940.
family heirlooms: varieties selectively bred through the generations by families or small communities of amateur growers. created heirlooms: varieties created by careful crosses between two known heirlooms or one heirloom and a hybrid, to blend particular wanted qualities; this type requires growing out for stability for a good number of years before it becomes an heirloom in its own right. mystery heirlooms: generally the result of accidental, undesigned crosses in nature, but recognized and grown out to stabilize the type as with “created” hybrids; but often the exact parents remain unknown. Some comments are in order. The Jaune Negib type is quite hard to find (two U.S. houses are all we could find); and its flavor is described as “delicately mild”, which is not, to us, immediately appealing. Matina is essentially just a close runner-up to Stupice (if you want to impress other gardeners with your savvy, be sure to pronounce it correctly: Stew-PEACH-kuh). Stupice itself is good only in the relative sense of “good for such an early tomato”—and they’re small, about golfball size. On the positive side, Anna Russian shows up on a lot of people’s “favorites“ lists. Dr. Male describes it as having “a sweet and juicy taste, which is usually not present in early tomatoes…Also, it’s a heavy producer—not common for heart-shaped varieties—of 1-pound fruits in clusters of two or three.” It’s an indeterminate type, so needs caging and/or staking. Also good news: Sophie's Choice has a flavor that is (again per Dr. Male) “uncharacteristically strong for an early-season variety, and is equal to that of later-maturing tomatoes. The flavor is full bodied and smooth—it’s not subtle bit it doesn’t scream at you, either…The fruit production is high for such a small plant…” This variety is determinate, meaning it is well adapted to container growing; also, it actually prefers slightly cooler weather. Combine those things and you have a prime candidate for indoor containering (though it will still do well outdoors provided you don’t get scalding temperatures). So, though we undoubtedly are stepping on many toes, as tomatoists are famously fierce in their preferences, we would recommend for those in season-limited circumstances like ours the Anna Russian and Sophie’s Choice types, with the latter especially good for container growing. But there are other possibilities… We say “possibilities” because it all depends on how much one wants to try to push the envelope on growing season. If we look at our climate (as you should look at yours), we want to be sure we set out our transplants a good two weeks or more after the last-frost date; for us, the last-frost date (as always, on average) is May 10th (not much different from Dr. Male’ reported date of May 15th), so if we wait till June, all should be well. At the other end, we have daily highs in the mid-70s till at least mid-Septembr. So, we could say our tomato season is about 92 to 100 or more days (June 1 to August 31, or on to mid-September). If we are both careful and lucky, we thus might be able to fit in some types with nominal growth periods of 90 days or even a little over. That means maybe some “midseason” types. But the two tomato types that get cited as “best” more often than any other, and which thus might be our targets, are the Cherokee Purple and the Brandywine, “Sudduth Strain”.. The problem there is, as Dr. Male puts it, “black-red and black-purple varieties like Cherokee Purple, Cherokee Chocolate, Noir de Crimée, and Black from Tula all color up abd taste better when grown in the south.” So maybe we should stay conservative and not be greedy. It’s up to you. Do not plant tomatoes or any of their garden cousins—potatoes, peppers, eggplants, tomatoes—in the same soil two years running, and a four-year rotation is much better, or you risk certain pests (eel worms, for example) becoming both severe and ineradicable. The first thing you need to know about any tomato cultivar you are considering planting is whether it is a “determinate” or an “indeterminate” type: determinate types—mostly (but not wholly) modern developments for commercial growers—form bushes that grow to a certain height and stop, and bring all their fruit ripe at about the same time; indeterminate types will grow and grow, sometimes to astounding lengths or heights, and will bear fruit all season long—they can be picked and picked. Most—but not all—heirloom tomatoes are indeterminate. Indeterminate types must be provided with large, sturdy supports to grow on: most people, including us, seem to favor circular cages made from heavy-duty large-mesh wire (some use “range fence” and some use the sort of reinforcing mesh normally placed in concrete—the latter has the advantage that one can make tall cages, five or six feet, without splicing sections). What makes a good cage diameter is debated, but Dr. Male suggests 22 to 24 inches, which works well for us. Be sure the cage mesh is large, say 6 inches, so you can easily reach through it to pick. Around here, about the earliest date for setting out tomato transplants would be June 1st. But—especially as we are growing types with relatively modest growth periods, in very roughly the 70-day range, why push it? We suggest mid-June or even a bit past (say, June 20th). One might get away with trying a little earlier, but why risk your whole season for a couple of “stolen” weeks? Planting out on June 19th still leaves almost 3 months for growing (and picking). But whatever your inclinations, wait for the soil temperature to reliably be 65° or more. Since we want our seedlings to be 6 to 8 weeks old, we should start them somewhere from April 24th to May 8th. If at all possible, provide heat beneath the seed tray, because the optimum temperature for tomato-seed germination is 86° F. If you haven’t got heating pads or something of the like, meant for the purpose, set your trays or whatevers over something warm, like a light or a refrigerator top—but it’s best to do the job right with things meant for the purpose. Be sure the mix remains moist, but not soggy; a true mister is a handy thing for this. At the first signs of seedling emergence, put the tomatoes where they will receive plenty of light; the best technique is to place them directly under purpose-made fluorescent fixtures fitted with fluorescent tubes intended for plant growing (be sure to keep the lights not over a couple of inches above the plants’s tops); give them a good 16 hours a day of light. You can stop providing direct heat when seedlings emerge, but continue to keep them in a warm area. When the second, or “true” set of leaves arrives (at emergence, there is a small set of “false” leaves that are not really leaves—the true ones show up when the plant is perhaps a couple of inches tall) and show two true leaves, it’s time to transplant—not outdoors yet, but into roomier quarters, such as 2-inch cells. Wait a couple of weeks, then apply a mild, dilute liquid fertilizer (too strong and it’ll almost literally “burn” your tender seedlings). If at any time you see any plants whose lower leaves are deveoping a distinctly brown edge, just pull off those leaves. When your seedlings reach perhaps 9 inches to a foot in height, it’s time for them to go outdoors—exactly when being in good part dependent on the weather. “Going outdoors” doesn’t mean being transplanted yet, it means being “hardened off”—gradually acclimated to being outdoors. Set your trays outside in a shaded area for a few days (bringing them in at night), then move them to a partly sunny and eventually, over time, a full-sun area. Take a week or so for this process, and during that time, reduce their water supply; but about half a day to a day before the actual transplanting, give them a good dose of water. Also, if you see any blossoms forming at this time, remove them: it’s too early for fruiting. The outdoors tomato bed should be prepared by deep digging, addition of organic material, and—as tests may show necessary—amendment with organic fertilizers. 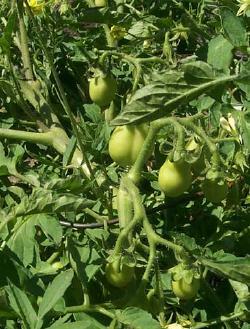 Tomatoes do best in a rich, loamy soil, though they’re reasonably tolerant. A standard garden-soil pH of 6.5 to 6.8 works fine, but they can do well enough in anything from 6.0 to 7.0. It is wise to use plastic mulch, and to set that mulch out a couple of weeks before transplant time to get the soil warmed. Plastic mulch also suggests drip irrigation, which is always a good thing; and row cover is advantageous as well in our climate. Transplanting out can be done in several ways. Some simply plant in the usual manner; with tomatoes, that means setting them deep, as deep as possible, so that the lowest leaves are just barely above the soil surface. Another technique is trenching: make a shallow trench, say 4 to 6 inches deep, then lay the seedling (which is, recall, 9 to 12 inches tall) on its side in the trench, gently bending the stem so that only the plant’s top is above the soil surface (there are some illustrative photos on one of the sites linked below, well down that page). The virtue of this technique is that tomatoes will send down roots from any part of their stem that is in contact with soil, so this way one gets a lot of root, with much of it near the surface, where warmth and water access are better. But (there’s always a “but”), on the other hand, the root system isn’t as deep as with conventional planting. Dr. Male’s recommendation is to trench only for those seedlings that look spindly or “leggy” and are scarcely able to stand upright on their own; the good doctor grows an immense number of tomato plants annually, but we who grow less than immense numbers can afford to overplant and be picky by culling leggy seedlings at transplant time. Still, both methods bear consideration. As you see, peat pots are not felt by experts to be the best approach; but if you’re using them, be sure to bury their rims a good inch below the soil level, lest they wick out moisture from the soil to the air. Keep your tomatoes regulary and perhaps above all evenly watered: an irregular water supply is at the bottom of many of the common problems seen in garden tomatoes. Do not over-fertilize, else your plants will send their energies into vegetative growth rather than fruit-setting. If you have prepared the soil well, that should suffice. If you like, you can add a little balanced, mild, liquid supplementation about two weeks after transplanting out, then again when you see fruit actually starting to set. Though one can get arguments on the subject of pruning tomato plants, we’ll go with Dr. Male’s advice: don’t. Do, though, try to gently assist your plants to make best use of their cages by training vines as appropriate. As tomatoes come ready, pick them. With indeterminate plants, the more you pick, the more you get—like that bunny, they just keep on going, and going, and going. When the weather gets cold enough that you fear for the continued life of your tomato plants, go ahead and pick any green tomatoes remaining on the vine; those can be ripened indoors. Tatiana's TomatoBase - an amazingly complete tomato database: the place most tomato experts go to first for information on unfamiliar types. Tatiana Kouchnareva runs a variety-preservation farm (which maintains over 4,000 varieties of open-pollinated, non-GMO, vegetables—1,178 tomato types), and also sells seed to help support the operation. A must-visit for any tomato fancier. Tomatoes are of the wonderful Solanaceae (or nightshade) family, as are peppers, tomatoes, potatoes, and eggplants, among others. There are nine species in the Lycopersicon genus, but only one other than L. esculentum is edible: L. pimpinellifolium, which is the so-called “currant” tomatoes (pea-sized tomato-ey things having chiefly novelty value). All non-“currant” tomatoes are L. esculentum, but there is this distinction: the “standard” tomato is L. esculentum esculentum, while the cherry-tomato types are classed L. esculentum cerasiforme--which is closer to the ancestral tomato type. There is a decent tomato history on line; it dispels the nonsensicality of the commonly accepted myth that no Westerner ate tomatoes till some brave soul in the 19th century ate a bunch in a public display. It was last modified on Monday, 4 February 2019, at 00:56 EST.